Encountering Authentication Failure errors when connecting to ProtonVPN while using 3rd party VPN clients? Read on to find a list of solutions to this problem. There are a number of ways to connect to ProtonVPN apart from our native application (currently available on Windows). It is also possible to connect using a third party OpenVPN client such as Tunnelblick on Mac, the OpenVPN package on Linux or different mobile clients on iOS and Android. 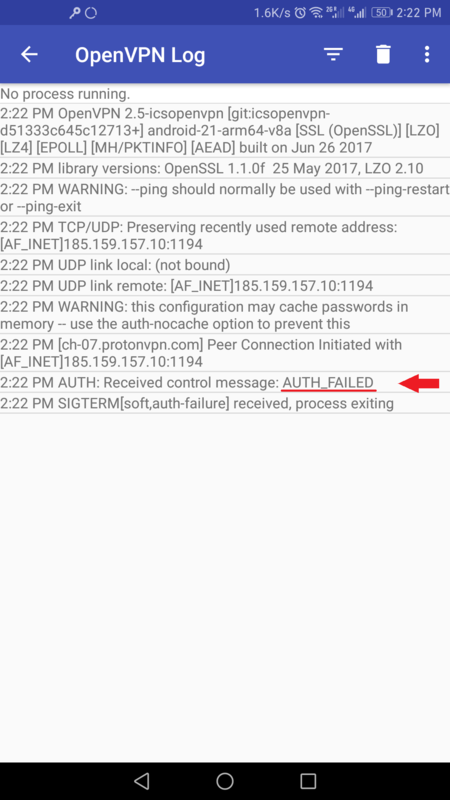 What is an Authentication Failure error and why does it appear? You have hit your maximum number of concurrent sessions. Different plans have different max number of simultaneous sessions, e.g. Free user get 1 connection, while Plus users get up to 5 connections. For more details, check out the different ProtonVPN Plans. Verify that you’re using correct OpenVPN credentials. 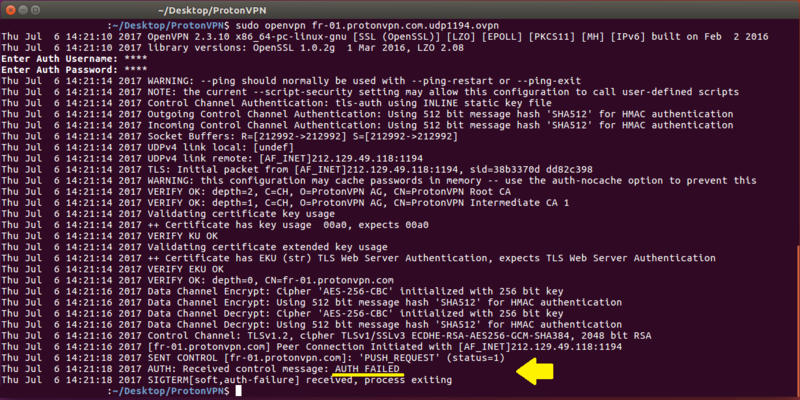 Make sure you are using your OpenVPN credentials (and not your Proton credentials). ProtonVPN employs two sets of credentials, your Proton account credentials, used to log in on our homepage protonvpn.com (or to your email if you are a ProtonMail user), and your OpenVPN credentials, which are used to authenticate with the VPN servers if you are using a 3rd party OpenVPN application. For security reasons, you must use your OpenVPN credentials and not your Proton credentials when logging in via third party VPN applications. See this article for details on where to find and set your OpenVPN credentials. Confirm that you’re accessing servers which are available for you ProtonVPN plan. Check that the server you are trying to connect to is available for your subscription. ProtonVPN has different plan offerings and each tier has access to a different set of servers. For example ProtonVPN Free users only get access to free servers in these countries, while ProtonVPN Plus users get access to all servers in all countries, including Secure Core servers. See here for more details on different servers or check out our different plans. Make sure that you are using a reputable client. Make sure that you installed the correct client and have updated to the latest section. For example, a staggering number of VPN clients (external link – CISRO research paper, PDF) available in the Android Play store are not properly implemented and pose a security risk instead of improving your privacy. Despite a few bad implementations, a good number of reliable clients exist. If you have auth problems, please use one of our recommend clients from our guides for Mac, Linux, Android, and iOS. Check whether a different server works. Connect to a different server in a different country and see if this issue persists. Sometimes, we need to take certain servers offline for maintenance and as such it can happen that they are temporarily unavailable. In the ProtonVPN native applications, this information will automatically be displayed. For third party clients, check the server page and or our ProtonMail status page to see if there are any reported downtimes. Check number of connected devices / wait x minutes and retry. Make sure that you do not have more devices connected than your maximum number of allowed connections. Is that the laptop in the other room still connected? How about your workstation? Or that tablet at your parents’/friend’s/partner’s place still connected? Double check your past devices and make sure that none of them are keeping their sessions alive and taking up connection slots. Upgrade to a plan that has more connections. As mentioned, different plans allow different number of simultaneous connections, and while everyone’s connected devices increase. If you need more connections, compare our plans and consider upgrading for more connections. Change OpenVPN username and password and retry the connection. If all of the have not yielded good results, try changing your OpenVPN username and password as explained here and see if this enables you to connect again. Warning: this will require you to reset all other existing devices which use the OpenVPN password (native clients will adjust automatically). Example: you have Tunnelblick set up on Mac succesfully but encounter issues with iOS connections. If you reset your OpenVPN credentials, both devices need to be reconfigured. Get the latest OpenVPN config files. Periodically, we do update config files, and servers are sometimes removed, reassigned, or added. If none of the steps above are working for you, try going to the ProtonVPN Dashboard (account.protonvpn.com) to get the latest OpenVPN config files for your platform. Logging in to account.protonvpn.com requires using your Proton username and password (details here). If you’ve tried all of the steps above and are still encountering authentication failure, please contact our support team via protonvpn.com/support-form and provide us with results for each of the above steps. That way we can directly pick up where you left off and continue to solve the Auth Failure and connect your to ProtonVPN in a timely manner. Hello I have just installed ProtonVPN and I want to access a site that is only available within the UK. I have set my VPN to the UK but it still will not let me access the page. Am I doing something wrong? New to Proton. Trying to connect and posting Authentication password but it doesn’t accept it. Simply asks for it again and again. Am I missing something? Hello Matt, please make sure that you are using the OpenVPN credentials and not the ProtonVPN credentials as they are two different types of authentications. Since I’m using the FREE plan, I get this message when trying to connect to either of the two server sites I’m permitted to use. This trouble seemes to be the result of upgrading to ver 1.6.2. Prior to the upgrade, I have had no trouble using the FREE plan. It doesn’t even get to the sign on window. Would you be able to tell me what I’m doing wrong? Please contact our customer support team and we will do our best to help you out! I’ve ran into the same issue. You have to upgrade your OpenVPN software. The ‘block-outside-dns’ option is supported in OpenVPN 2.4 and above. Could you please contact our support with full connection logs? Could you please provide a ‘how to’ to setup the OpenVPN on a Chromebook/Chrome OS ? I have purchased protonvpn plus and it works like a charm on Android and Linux. Unfortunately I presumed it would work via the OpenVPN feature on Chromebooks too… Thanks! Could you please contact our support team, we are sure they will be able to help you out! warning ; Tunnelblick could not fetch IP address information before the connection to is-nl-01.protonvpn.com.udp1194 was made. – NOTE: The DNS servers do not include any free public DNS servers known to Tunnelblick. This may cause DNS queries to fail or be intercepted or falsified even if they are directed through the VPN. Specify only known public DNS servers or DNS servers located on the VPN network to avoid such problems. Hello, we cannot figure out why Tunnelblick is returning this error. Whenever you will connect to a VPN server, simply check http://ipleak.net whether your computer does leak DNS, however, DNS shouldn’t leak and if they do, please contact us via https://protonvpn.com/support-form and we will check where the issue might be. Could you please contact us through the following link, and provide more details regarding which platform you are using as well as send us a screenshot of the error message?